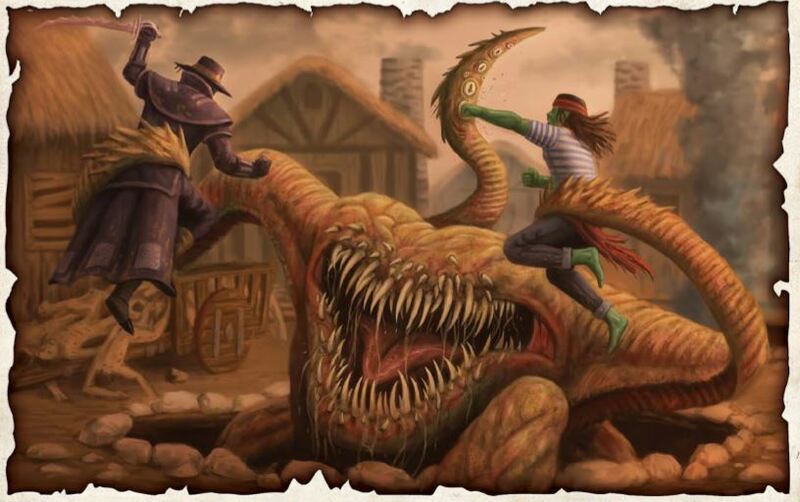 In the second part of this article, we look at the remaining monster types within the Pathfinder Roleplaying Game, and where they fit into the dynamic Freeport setting. Find the first part of this article here: Monsters in Freeport, pt I. One of the things players and GMs alike love about Freeport is its blend of fantasy genres and flavors. It’s a pirate city, but it’s also the site of an ancient serpent people empire, a location for cultists of mad gods, an escape from a continent that waged a war with a series of necromantic warlords, and the center of a trade route that can include sea-travel to alternate realities. Its tone ranges somewhere near “pulp swashbuckling Lovecraftian horror,” which is a neat idea but can be hard to maintain. There’s an introductory adventure in the Freeport City of Adventure hardback to help get GMs started, and the Return to Freeport adventure series currently being released in pdf, but a GM wishing to expand beyond those may find it difficult to maintain the “Freeport tone” of other encounters. In short, some GMs could use some guidance on what Pathfinder Roleplaying Game monsters fit well in Freeport… and which don’t. Luckily, the Pathfinder Roleplaying Game has a number of useful tags and categories that can be used to help determine if a creature is going to feel out-of-place in a Freeport campaign. While it hopefully goes without saying, I’m still going to note that all of these are suggestions only. There’s no “wrong” way to run or play in a Freeport campaign as long as everyone is having a good time. If you and your players love telling the story of the open war between androids and devils fought publicly in the city’s streets, have at it! To a much lesser extreme, a Freeport campaign may well have less “typical” encounters from time to time as examples of unusual occurrences, and there’s nothing wrong with that. These ideas are just guidelines for how to try to stay within the existing feel of Freeport products, so if you vary from that feel you do so intentionally, rather than by accident. There are thirteen creature types: aberrations, animals, constructs, dragons, fey, humanoids, magical beasts, monstrous humanoids, oozes, outsiders, plants, undead, and vermin. This article covers magical beasts through vermin. Magical Beasts: Magical beasts are creatures that have animal- or insect-like appearances but have magic abilities or more advanced intelligence, such as basilisks, blink dogs, chimera, and owlbears. Magical beasts that lack their own cultures and settlements can be used in much the same way as animals – to a typical Freeporter there’s not much difference between a grizzly bear in a menagerie and an owlbear in the same cage. Magical beasts with strong ties to real-world cultures may feel out-of-place in a typical Freeport encounter, but can certainly be used in adventures that travel to foreign lands more in keeping with their origins. And more intelligent magical beasts can be used to help evoke a sense of horror in a Freeport campaign. Being stalked by a pack of wolves is cause for concern, but realizing the wolves are actually sandstorm-summoning sha who are seeking to kill the PCs to rip off their scalps and return them to some insane master for a bounty can radically alter the feel of an encounter. Monstrous Humanoids: Monstrous humanoids are essentially humanoids with monstrous or animalistic features (and often supernatural powers), such as centaurs, hags, harpies, and yeti. In most cases monstrous humanoids are too monstrous to be accepted in the streets of Freeport (though they are more likely than aberrations to be able to sneak around in alleys and back rooms, especially if they have the money to pay others to do some of their dirty work and make arrangements). 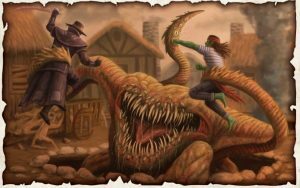 Once outside of the city, or down in the sewers or ancient sea caves, monstrous humanoids generally work very well in a Freeport adventure. Some with strong ties to real-world cultures may feel out of place, but those can generally be given purely cosmetic changes to make them feel more like swashbuckler-horror-adventure foes. A minotaur with a greataxe may seem specifically Greek, but an anthropomorphic wildebeest-man with a Medium longspear (used one-handed) and a hide shield gives a very different feel even if it still uses the rules for a minotaur with a simple weapon change. Oozes: Oozes are amorphous mindless creatures such as gelatinous cubes, giant amoebas, and ochre jellies. Oozes don’t feel much like Freeport monsters as a group… but describing an unknown, colorless mass slithering across the floor with long tentacles reaching for a player character certainly evokes the kind of pulp horror that often lurks in the darkness of a Freeport adventure. The best way to integrate oozes into a Freeport game is to forget they are oozes, and just think about how to describe them while focusing on their shapeless, slimy, tentacled forms. You may even wish to rename them (though obviously still giving PCs who make appropriate Knowledge checks the same level of information about strengths and weaknesses). A gelatinous cube doesn’t feel like a Freeport threat, but the Lurker in Ruins does, even if it’s the same monster. Outsiders: Outsiders include creatures that are partially made up of, or attuned to, the essence of planes other than the material plane, such as devils, archons, elementals, and rakshasa. Outsiders are an odd case for Freeport. Certainly native outsides, such as barghests, rakshasa, and oni, make excellent supernatural foes with ties to powers beyond the PCs reach (and possibly beyond their understanding). Other outsiders often work best as incomprehensible forces that can be summoned or bargained with, but not fully trusted or controlled. A cultists summoning demons to slay his enemies is very Freeport. A devil-worshipping sect wishing to do their ineffable master’s bidding, a few of which have been infused with his power to become tieflings, is very Freeport. A devil lurking and plotting directly from a Freeport building feels less like the unique blend of elements that helps set Freeport apart. Plants: Rather than mundane bushes and trees, creatures of the plant type are generally mobile plantlike monsters, such as assassin vines and shambling mounds. Plants this dangerous are likely to have been cleared away from major settlements, but in jungles, ruins, and abandoned ships they are fair game and a great example of Freeport encounters. Undead: Undead represent the once-living, who have been restored to unlife through negative energy (and generally evil means). Undead of all sorts make excellent Freeport monsters, but some thought should be put into who or what they were when living. A skeleton pirate sailor has a very different look and feel than a pirate serpent person, even if they might have the same statistics. Fresh undead are likely to be juicier, ancient undead more dry and cracked, and thinking undead may keep up with modern fashion, recreate the fashion of their era, or discard attire as a concern for the loving. Making note of these minor things can help undead feel like integral parts of a Freeport story, rather than bolt-ons from a random encounter table. Vermin: Vermin are mindless “bugs,” including insects, spiders, scorpions and (importantly for Freeport adventures) crustaceans. While most common vermin aren’t a significant risk (though many could carry diseases), giant vermin are prime candidates for Freeport encounters. In ancient ruins and sewers giant spiders, ants, centipedes, and similar creatures are both common and just creepy enough to play into the pulp-adventure-horror vibe of Freeport. Anywhere near the ocean, giant crabs, killer lobsters, and carnivorous shrimp swarms make fine and disturbing) monster choices. Since most vermin are pretty straight forward, a GM can easily reskin more typical land-dwelling vermin as monstrous crustaceans (giving them swim speeds as needed). There’s no reason you players need to know that “toxic krill clouds” are just spider swarms (poison and all) relocated to brinier environments.